This Wireless IP Kidde Carbon Monoxide Alarm Spy Hidden Camera Can Send Live Video In Realtime Over the Local Network and The Internet. The SWIP-CMA Wireless G Internet Spy Hidden Camera connects to an Ethernet or wireless network to enable remote high-quality video recording. 802.11g wireless technology allows you to place the SWIP-CMA in places that were previously inaccessible such as Desktop. Support for the WPA® and WPA2® standard ensures that you will be provided with the highest level of security when connecting to your wireless network. Easily configure and manage your camera: With the included SWIP-BF software, you can manage up to 32 network cameras, set e-mail alert notifications, set recording schedules, and enable motion detection-triggered recording directly to a local hard drive. You can even upload a floor plan of your home or small business and create a realistic layout of where your cameras are located, providing you better access to your camera. Keep an eye out on your kids, pets, home, or office remotely by simply logging onto the SWIP-PF using a Web browser from any computer with Internet access. The SWIP-BF adheres to the Universal Plug & Play (UPnP) specification, which allows for automatic camera detection and addition to networks. Once recognized by your network, the SWIP-PF can be accessed and viewed from "My Network Places" as a device on your network. You can then stream the feed from the SWIP-BF to any compatible digital media player to view from the comfort of your living room. With features such as MJPEG streaming and SWIP-CMA management, the Wireless G Internet Camera (SWIP-CMA) is a cost-effective and versatile security solution for your home or small business. The SWIP-CMA Wireless G Internet Camera is a versatile solution that connects to your wired or 802.11g wireless network to provide remote monitoring over the Internet. Schedule recorded video or snapshots to be uploaded to an FTP server or sent via e-mail.Original Functions Are Nonworking! 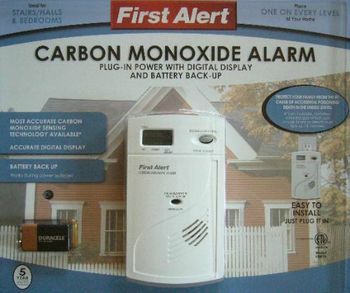 ~ None of the original functions of the Carbon Monoxide Alarm work. ~ Camera is powered by pluging the unit to 110V AC wall outlet . ~ The camera is pointing out and slightly. ~ The viewing angle is 70 degrees wide and 60 degrees tall. ~ There are no beeps, no lights, no noise and no sign that a camera is inside.